help schools to improve the quality and effectiveness of pupils’ education and of the care for their welfare provide rigorous and reliable inspection reports which help schools to recognise and celebrate their strengths and to identify and remedy any weaknesses inform parents and the wider public of the quality of British schools overseas by placing reports in the public domain. 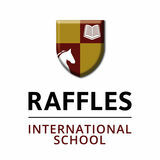 Information about the school Raffles International School - South Campus is a private school which opened in September 2007. It is situated in Al Baghla Street, Umm Suqeim. The school provides education for four to14 year olds and currently there are 1693 pupils who attend the school. Of these, 220 children are in the early years and 221 pupils are in the secondary phase. There are 96 different nationalities represented at the school. The majority of pupils are learning to speak English as an additional language. Very few pupils have been identified as having special educational needs. The school provides a Montessori curriculum in the early years, Cambridge Primary (CP) in Key Stages 1 and 2 and Cambridge Secondary (CP1) from Year 7 upwards. This is the first year where pupils in the school will take International General Certificate of Secondary Education (IGCSE) examinations. When pupils leave the school, they go on to attend a wide number of international schools. A number of new staff joined the school this year, including 25 teachers in the primary years. Summary of the evidence base used by the inspection team The BSO inspection was carried out by three CfBT Education Trust inspectors. The inspection was conducted jointly with a team of 13 DSIB inspectors and a separate report was written. The school was given three weeks’ notice of the start date of the inspection. 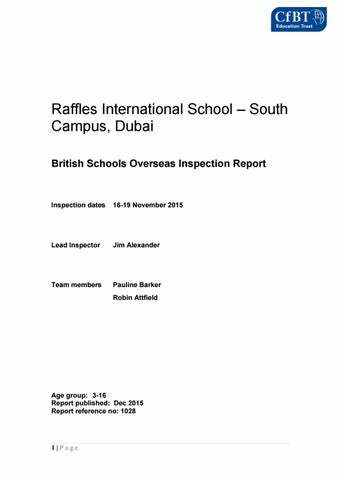 The inspection team had access to a wealth of information about the school prior to the inspection. Schools in Dubai are required to submit documents online each year and inspection teams can view these. The inspection team used the same evidence base for reaching the judgements found in both reports. Over four days, inspectors visited 143 lessons; one of these observations was jointly observed by the headteacher and lead inspector. Inspectors held 79 meetings to interview senior leaders, staff, pupils, parents and advisory board members. Inspectors reviewed parent questionnaires and other surveys completed by the school of parents’ views. The team scrutinised pupils’ work and school documents including the school’s self-evaluation; improvement plans, policies, assessment systems, and safeguarding procedures. They generally observed the school at work and followed up on any issues raised. first time this qualification has been offered at the school. Disabled pupils and those who have special educational needs are supported well in the majority of lessons and make good progress from their individual starting points. In most lessons, the most able pupils are also provided with work that challenges their thinking and extends their understanding; consequently, their progress is also good. Progress in science is good in secondary. In primary, the progress pupils make is increasingly good in some classes, but remains varied in a minority of classes. Primary pupils’ attainment is variable because teachers’ subject knowledge and the quality of teaching are inconsistent. Where pupils learn most effectively, they carry out investigations and develop their scientific skills. However, pupils’ learning is slower when teachers heavily direct these experiments and therefore restrict the development of problem-solving skills and opportunities for pupils to design fair tests. On occasions, lessons are worksheet driven, often focusing only on the development of scientific knowledge, which does not always provide sufficient challenge. In secondary, pupils’ progress is good overall and some is outstanding. This is because teachers’ subject knowledge is very good and there is greater consistency in the quality of teaching. Opportunities to develop knowledge, skills and understanding are more frequently balanced in lessons. For example, Year 9 learn about electrostatics and the concept of charge through investigations, clear teaching input, discussion and teachers’ challenging questioning. As a result, pupils make good progress in lessons. The above average levels of attainment they achieve in tests are matched by the quality of outcomes in lessons. Attainment in physics and chemistry is higher than in biology. Having identified this, school leaders are now effectively addressing this relative weakness. As well as achieving success in the core subjects of the curriculum, pupils’ attainment in other subjects is above average and their progress is good. Pupils use information and communications technology (ICT) well to support their learning and the recent ‘bring your own device’ initiative is proving very popular. A particular strength is the quality of music across the school. Recently, pupils increased both their skills and self-confidence by visiting a professional recording studio, not only to record their own performances but also to mix and edit their work. The school is also proud of a recent performance of their classical musicians at a local recital. Summary of other judgements against the BSO standards The quality of the curriculum provided by the school is good (see Standard 1 below). The quality of teaching and assessment is good overall (see Standard 1 below). There remain inconsistencies in the quality of teaching within the primary phase, particularly within science lessons. The quality of marking is improving, but not all teachers are yet fully adhering to the recently introduced marking policy. At times, teachers do not always have high enough expectations of what pupils can achieve in the time available. Excellent practice clearly exists in the school but is not always shared widely. Pupils’ spiritual, moral, social and cultural development is good (see standard 2 below). The welfare, health and safety of the pupils are outstanding (see Standard 3 below). The Standard for the suitability of the proprietor and staff is met (see Standard 4 below). The premises and accommodation meet the requirements of this Standard (see Standard 5 below). The provision of information for parents meets the requirements of the Standard (see Standard 6 below). The school’s procedures for handling complaints meet the requirements of the Standard (see Standard 7 below). The leadership and management of the school are good (See Standard 9 below). Even so, training for support staff to help pupils learning to speak English as an additional language and the extent leaders challenge their performance are not fully effective. Some subject leaders who are new to their role require further coaching to become highly effective. As a result of this inspection, undertaken during November 2015, the school has demonstrated that it meets the Standards for British Schools Overseas. This judgement is endorsed by the British Government, quality assured by the Office for Standards in Education (Ofsted) and is valid for a period of three years. strong in the early years and secondary and also in many primary classes. Teachers who mark pupils’ work in line with school policy clearly identify the next steps for them to achieve in their learning. However, not all teachers follow the school’s marking policy closely enough; consequently, the progress pupils make varies from class to class. Children’s self-assessment is strong in the early years. Many teachers across the primary and secondary phases also provide opportunities for pupils to self-and-peer-assess. There are good examples across the school of where staff use what they know of pupils’ starting points to set work which is interesting and challenging. Some teachers, however, are not using this information as effectively and, as a result, the progress of pupils in the primary classes is varied. Systems for monitoring and tracking pupils’ progress have been a recent focus across the school. It is too early to measure the impact of these developments on outcomes. The styles of teaching, learning and assessment are similar to those commonly used in schools within the UK, allowing pupils to easily enter or re-enter the UK educational system. competition alongside the local special school, with whom they enjoy many links, and collectively, pupils from both schools won many prizes. Currently, the impressive pupil leadership team is planning to extend the donations they make to a charity to support children in countries devastated by natural disasters. Pupils also contribute to the support of local workers through ’shoebox’ appeals. Through many aspects of the school’s curriculum, pupils learn about local culture in Dubai and the Emirates and their understanding of their immediate culture is therefore growing. For example, there was support for those who were fasting at the time of Ramadan. Pupils undertake much comparative study of the ways of life in many countries, one of which is the UK. They also take part in a number of celebrations and remembrances, such as Harvest and Remembrance Day. The latter is set in the wider context of Martyrs Day, thereby engendering a multicultural approach to learning. Pupils’ understanding of British life is developed through using British news and discussing topics of interest as they arise. Human rights issues are addressed also through the social studies and humanities curriculum and in English literature lessons. For example, pupils investigate the issues of asylum seekers coming to Britain through the study of a contemporary poem. making their IGCSE choices. The school continues to develop the careers guidance which is offered to older pupils. The school doctor and two nurses provide a high quality of care. Health and medical records are meticulously kept and stored securely. Medication is kept in a locked cabinet. The first aid policy is fully implemented and staff trained regularly. The medical team keep relevant teachers fully informed about the medical needs of individual pupils. Healthy living is promoted strongly. School nurses support this by teaching lessons on making healthy food choices and regularly check lunchboxes to ensure this happens. Aspects related to healthy living are strong features in the curriculum and school assemblies. Timetabled physical education and opportunities for pupils to participate in a very wide variety of sports clubs and activities also promote a healthy lifestyle. Standard 4. The suitability of the proprietor and staff The school meets the requirements of this Standard. The proprietor and advisory board have high expectations of senior leaders, who are rigorous in carrying out all required checks on current and new staff members. These ensure staff are suitable to work with children. Locally recruited staff are subject to similarly thorough checks. Staff appraisal procedures are well established and work well. Leaders have a very clear vision that all staff should have access to high quality professional development to ensure that pupils receive the best possible education and care. Appropriate support and challenge are provided when a member of staff is underperforming. School staff provide appropriate supervision for volunteers who support school activities and events. The school ensures that any volunteers, including parents, are vetted in a similar manner to employed members of the staff team. Standard 5. The premises and accommodation The school meet the requirements of this Standard. The premises and accommodation are of a high quality and support pupils’ effective learning. Daily checks of the school campus, carried out by the administration manager, ensure that the premises are safe and any maintenance issues are swiftly addressed. Relevant authorities carry out regular checks of the premises and the school has all the certificates needed to operate. Effective systems are in place to ensure the security of the school. Cleaning and maintenance staff ensure that the buildings and classrooms are spotlessly clean and maintained to a high standard. Pupils are proud of their school and treat their surroundings with respect. Both the indoor and outdoor areas are litter free. The school’s provision for preparing and consuming food is hygienic and well maintained. Vibrant displays of pupils’ artwork in public areas make the school attractive and give pupils a sense of pride. Classrooms are of a good size, provide attractive environments for learning and allow teachers to meet the needs of the curriculum. Resources are of a high quality and almost all areas of the school are well equipped. Effective use is made of the ICT available in classrooms, such as interactive white boards, and pupils use laptops and tablets to support their learning. Specialist teaching areas for music, ICT, PE, and humanities are resourced well. Good use is made of the well-resourced library. Recent enhancements to the facilities include the artificial turf in outdoor sports and play areas and the addition of shades. These make the school look attractive and support and protect pupils in sports lessons and at break times. Good use is made of the indoor and outdoor accommodation in the early years. The swimming pools and the outdoor sports facilities are well maintained and used effectively to provide pupils with a wide range of physical activities, both in and out of school time. There is an appropriate number of washrooms for staff and pupils. The school buildings allow safe access for all pupils, including disabled pupils and those who have special educational needs and there are appropriate medical facilities should these be needed. Standard 6. The provision of information for parents, carers and others The school meet the requirements of this Standard. The school communicates effectively with parents and creates a good partnership which supports the learning of children and pupils, particularly in the early years and primary school. Parents expressed strong levels of satisfaction in their responses to the survey about all aspects of the school. They are especially confident in the school’s leadership and about the information they receive. Through the open-door policy, parents keep in regular contact with both teachers and school leaders and raise and resolve quickly any matters of concern. Parents are involved in their child’s education and, for example, attend a year assembly led by their children and participate alongside them in the keep-fit activity. There is a suitable complaints’ policy if needed. This policy, along with others, is readily accessible on the school’s website. Parents are involved in a partnership to support their children’s learning. They receive comprehensive information on the school’s approach to learning through a detailed curriculum map. In the early years and primary school, parents receive regular communication about what children are about to learn. Workshops are held for parents to help them understand the content and methods of aspects of the curriculum; these are valued and well attended. Information is also made available for parents of secondary-age pupils. Parents receive regular reports on their child’s academic and social progress with particularly helpful comments on areas for improvement in each subject. There is a very active parents’ association, PARIS. This engages in fundraising activities and also works closely with staff and pupils to support special events. It has also been very active in programmes such as the Young Apprentice Programme. Parents play a key role in the school’s advisory board that works closely with the school and the board of governors. This group is consistently looking for new ways for parents’ views to be taken onboard. As a result, parents believe that they are consulted very well in decisions affecting their children and that their input is valued. Standard 8. The quality of provision for boarding Not applicable. there is some which is excellent. Again, there is much effective practice to share with some primary teachers to make sure pupils in these classes benefit from such good quality opportunities. The leadership of provision in the early years is outstanding. As a result, children benefit from an excellent start to their school life, make outstanding progress and are very well prepared to start Year 1. The early years leaders are effectively training and supporting staff as they begin to combine the effective Montessori approach to teaching and learning with requirements for the new early years curriculum. The advisory board is very effective. Members use their wide range of professional skills and experience to support the Chief Executive Officer (CEO) in her role. They know the school well, provide good support and are successful in holding the senior leadership team to account. They work closely with the senior team to meet challenges and bring about improvement. Clear financial management underpins the school’s development. The separate responsibilities of the advisory board and the school’s senior leadership team are clearly understood and respected by all. Procedures for the recruitment of staff and their induction are robust. School leaders are good role models for pupils. The headteacher in particular has a positive presence around the school and is always available at the start of the day to welcome pupils to school. Pupils readily converse with adults in a mature and confident way, and they clearly enjoy their school experience. School routines and the day-to-day running of the school is calm and purposeful, hence learning can take place in an ordered environment where pupils feel safe. Security arrangements are strong and safeguarding vigilant. Compliance with regulatory requirements Raffles International School – South Campus fully meets the requirements for British Schools Overseas. What the school could do to improve further While not required by regulations, the school might wish to consider the following points for development: Increase consistency in the quality of teaching and learning so that learning is consistently at least good, by: - making sure that the best practice within the school is shared more widely, for example in science - ensuring that the marking and feedback in books are consistent with the school’s marking policy - using the information gained from assessing pupils’ progress more consistently to inform effective lesson planning, so all primary-age pupils make the best possible progress in lessons. Improve further the effectiveness of leaders, by: - maintaining the commitment to train support staff and challenge their performance, so pupils who speak English as an additional language can be helped to make the best possible progress - continuing to provide ongoing coaching to subject leaders new to their role. GLOSSARY Achievement – Progress made by a pupil taking his/her individual circumstances and starting point into account. Accreditation – The system whereby a school or similar organisation is assessed against agreed standards and if deemed as having achieved the standards required is provided with some form of official certification or recognition. Accreditation Board – The body responsible for the strategic direction, operation and conduct of the accreditation service provided by CfBT Assessment – The process of finding out how well pupils have learnt what they have been taught. It is a continuous process that occurs throughout the school year, using a variety of forms for different purposes. Attainment – The level pupils reach, usually measured by reference to benchmarks, such as test and examination results. British Schools Overseas Inspection (BSO) – Inspection framework and standards defined by the DfE for British schools overseas to opt to be inspected against. CfBT Education Trust – CfBT is one of the world’s leading not-for-profit education companies providing a range of education services in the UK and internationally. Central Support Team – Personnel based in CfBT Head Office who are responsible for the administration of the various educational services provided to international schools. Combined or Joint Visit – a BSO Inspection visit combined with an ISQM accreditation or re-accreditation visit conducted (or DSIB inspection in Dubai) at the request of the school. This will be carried out concurrently with reference to both frameworks and sets of standards. Some of the standards against which the school will be inspected are common, but some of the BSO standards relate to the British nature of the school. Cycle of Inspection – The period of three years between BSO inspection visits. Curriculum – The educational programmes or courses of study taught by a school including subjects and activities inside and outside the classroom, as well as extracurricular enrichment programmes. Dubai Schools Inspection Bureau (DSIB) – All private schools in Dubai are required by the Knowledge and Human Development Authority to be inspected by the Dubai Schools Inspection Bureau (DSIB). A joint DSIB/BSO inspection may be requested through the KHDA’s strategic partner CfBT Education Trust. Leadership – Leadership at any level (for example principals/headteachers, governors, board members, team/subject leaders) involves setting direction, empowering staff to work effectively, creating a suitable environment for learning, and setting an example to others. It entails different skills from management. Learning – Pupils’ gains in knowledge, skills and understanding. Management – The practical business of running a school, department or aspect of a school’s work in an efficient and useful way. Ofsted – The Office for Standards in Education, Children’s Services and Skills is the non-ministerial government department of Her Majesty’s Chief Inspector of Schools in England and is responsible for school inspections in England. Progress – The gains in learning made between two points in time. A pupil can be described as having made insufficient progress, satisfactory, good, or outstanding progress in relation to his/her starting point. School self-evaluation – The identification by the staff of a school of its strengths and weaknesses across the key aspects of its performance. Effective self-evaluation focuses specifically on the impact of the school’s work on the outcomes for pupils. Standards – (1) The levels of knowledge, understanding and skills that pupils and a school demonstrates at a particular point in time. (2) The evaluation requirements to be used in the inspection of British Schools Overseas. Teaching – All activities undertaken by the teacher aimed at enhancing pupils’ learning.